8th Annual TDT Guess the Game Challenge Underway! It’s that time of year again! 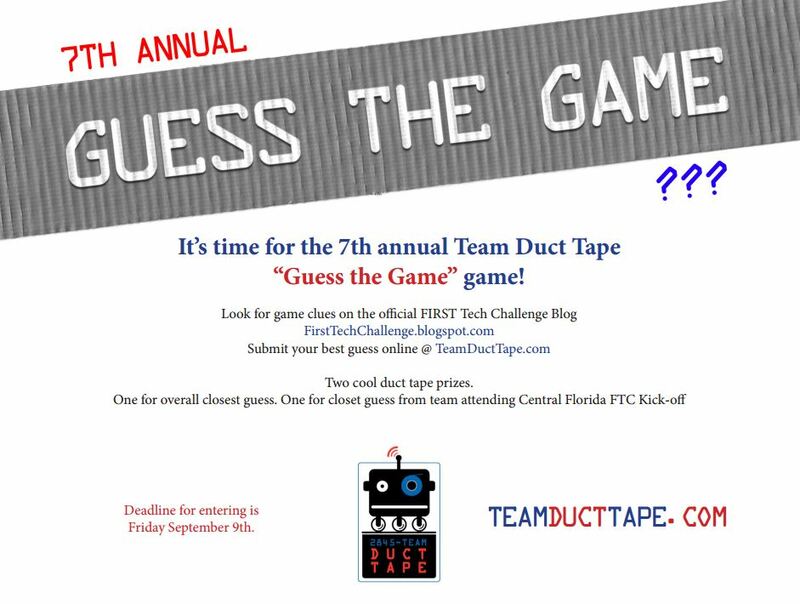 Before the September 9 FIRST Tech Challenge international kick off, we invite teams around Florida and everywhere to join in our annual Guess the Game Challenge! Share your best guess on how the new season game Relic Recovery will be played, and we’ll award one in-state winner a handmade duct tape prize and we’ll send a special prize to the person with the closet guess, out of state. So start following along the FIRST Tech Challenge blog and looking for clues, and enter your best guess HERE. Time for 7th Annual TDT “Guess the Game” Game! It’s that time of the year again, for the 7th year in a row! It’s time for the Team Duct Tape “Guess the Game” Game! Hopefully you’ve been keeping up with the FIRST Tech Challenge blog in the last few weeks, and if you have, you might have seen some allusions to game hints there, like on July 1 for instance. Check out some of the posts after that, too, to see if anything looks promising. Even you don’t see any game hints, you’ll get lots of good information for you new season. Good luck, and Go Teams!